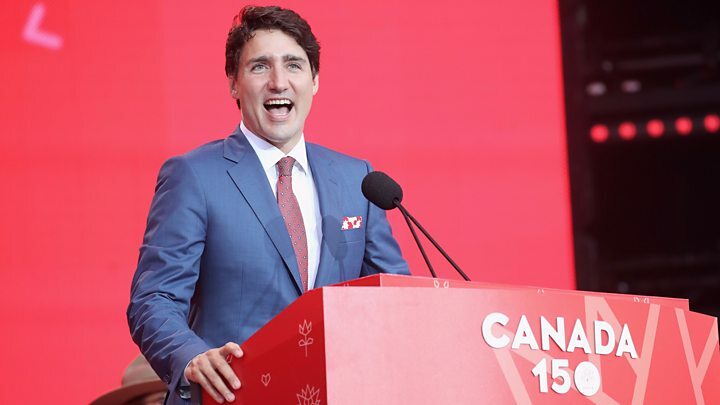 Media captionCanada's Justin Trudeau: "I'm a little embarrassed"
Canada's Prime Minister Justin Trudeau has infuriated people from Alberta, after failing to give the province a shout-out on Canada Day. The gaffe came as the country celebrated its 150th birthday at the weekend. Kicking off celebrations, the PM name-checked 12 of Canada's 13 provinces and territories - but not Alberta. Within minutes, angry Albertans were debating the slip on social media, with many insisting it was deliberate. "The omission was completely intentional. He had a teleprompter," fumed Twitter user Dave Dunbar. "When you let the whole country know how you feel about #Alberta eh' #Trudeau," wrote one young woman in the western province. "Did Justin Trudeau really leave out Alberta in his speech? I'm howling here, oh my God what a moron," rued chooseylucy1 in Toronto. Mr Trudeau quickly realised his mistake, and jumped back on the stage at Parliament Hill in Ottawa. "I love you, Alberta," he called out, blowing a kiss. The Liberal Party leader was seen shaking his head as he sat down again. A little later, he repeated his apology online. But as word of the error spread, Mr Trudeau's political critics moved to capitalise on it. Michelle Rempel, a Conservative member of Parliament representing Calgary, posted a video on Facebook where she claimed "something really bad happened on Parliament Hill". "The prime minister of our country - on Canada Day! - forgot that Alberta exists," she said. "I don't think this was an accident. Justin Trudeau continually forgets our province." Unfortunately, the PM picked the wrong four million people to slight. Alberta, traditionally a more conservative province, was a hotbed of opposition to his father - former Canadian Prime Minister Pierre Trudeau. In October 1980, he ended deadlocked talks about energy pricing by pushing through the National Energy Programme, raising outrage in oil-rich Alberta. What does it mean to be Canadian today? What's in store for Canada's next 150 years? While the critics raged, many other Canadians failed to see the big deal. "For all you people whining that PM Trudeau forgot Alberta - RELAX," tweeted Jacqueline Roy from Ottawa, adding the hashtags "#peoplemakemistakes", "#HappyCanadaDay", and "#mycountryincludesAlberta". The attempts to smooth ruffled feathers only raised more, though, as Albertans defended their right to be furious. "Can you imagine the stink raised he if he would have forgot Ontario.... or God forbid, Quebec!!!!" one Twitter user commented. "If he would have missed Quebec there would have been riots in the streets," agreed Cal Howard. Perhaps keen to ensure they aren't overlooked again, miffed Albertans shared a mock geography test online. It seems unlikely Mr Trudeau will repeat the blunder in future. Canada 150: What does it mean to be Canadian today?